Bright Eyes really does live up to its name, with a hot pink eye in a pale pink face, making a real statement in any herbaceous border. The clusters of flowers in the midst of summer are very colourful and sweetly scented, lasting for a long period. This clump-forming perennial has lance-shaped leaves, which become purple in colour towards the flowers, setting them off to a tee. Phlox attracts many butterflies and bees throughout the summer, making it a useful addition to a wildlife border as well. 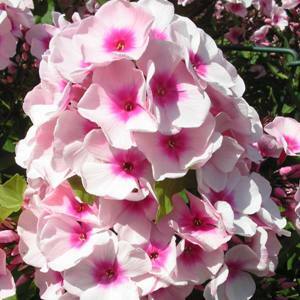 Grow in any moist, free draining site in sun or partial shade. Deadhead to promote flowering and cut back to just above ground in October.